Angel Delight is one of those things that you’d have had to have grown up on Mars not to have a memory of. So, I asked the Mums’ Days Community on Facebook for their memories, and how fabulous they were! Plus a few interesting recipe ideas too (Bailey’s Ice Cream made with Butterscotch Angel Delight, anyone?! Errrr, yes please Elaine!)! 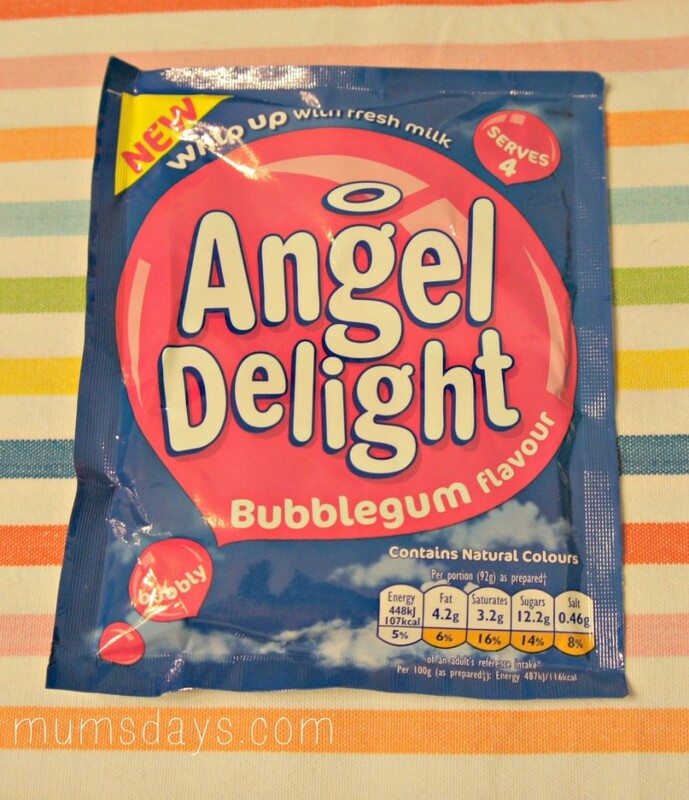 We have been sent some Angel Delight by Britmums… The brand new Bubblegum flavour (now in Tesco stores nationwide. 3 for £1.20 people!). I’m not going to lie this sounds both disgusting and wonderful. Gabriella has a penchant for Bubblegum flavoured things and I always give it a try but the most recent thing was an ice lolly. I kid you not, it was like licking cotton wool. I couldn’t understand how something wet could taste dry. A very strange sensation! But nonetheless I was definitely up for a bit of Bubblegum Angel Delight. Surely this master of the fluffy dessert could do it justice? 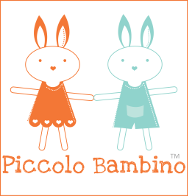 This post is actually a competition so I’ve been wracking my brain for ages to come up with something super inventive and original…there are so many wonderful ideas out there (not least the other entries for this competition! ), I couldn’t possibly even try and reinvent the wheel here. Ultimately, I have decided to take it back to basics and create some new Angel Delight Moments with Reuben…with a little added spark! Firstly making Angel Delight is a doddle, (unless you’re me – I literally look like I’ve never held a whisk before! 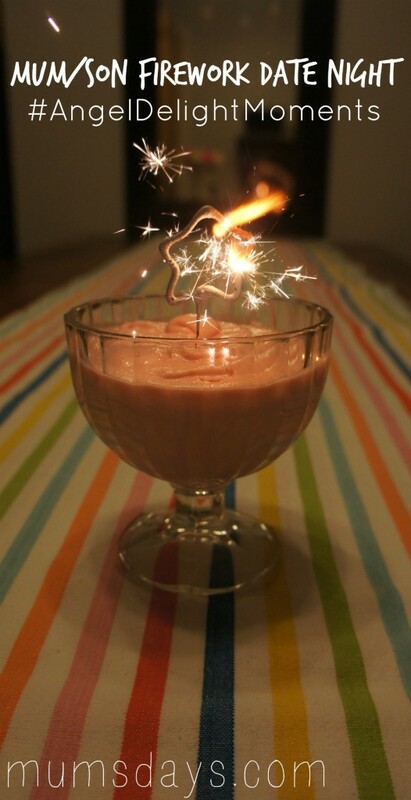 ), so I give you… a dummy’s guide to making Angel Delight. Reuben and I were home alone on Bonfire Night; Mike’s away with work and Gabby’s at her mum’s. I thought this would be a lovely opportunity for us to enjoy a little Mum/Son quality time. If I know my son, and I do, his favourite thing in the whole world is dessert. Thank you Angel Delight, that’s the treat sorted. At just over two he is not a massive fan of fireworks. From a distance they’re OK but right above your head? “No thank you” he kept telling me at the weekend, bless him, so I quickly took him back in the house! Between you and me, the bubblegum flavour was wonderful (scrap the disgusting bit, what does Heston know anyway?! Ha!). 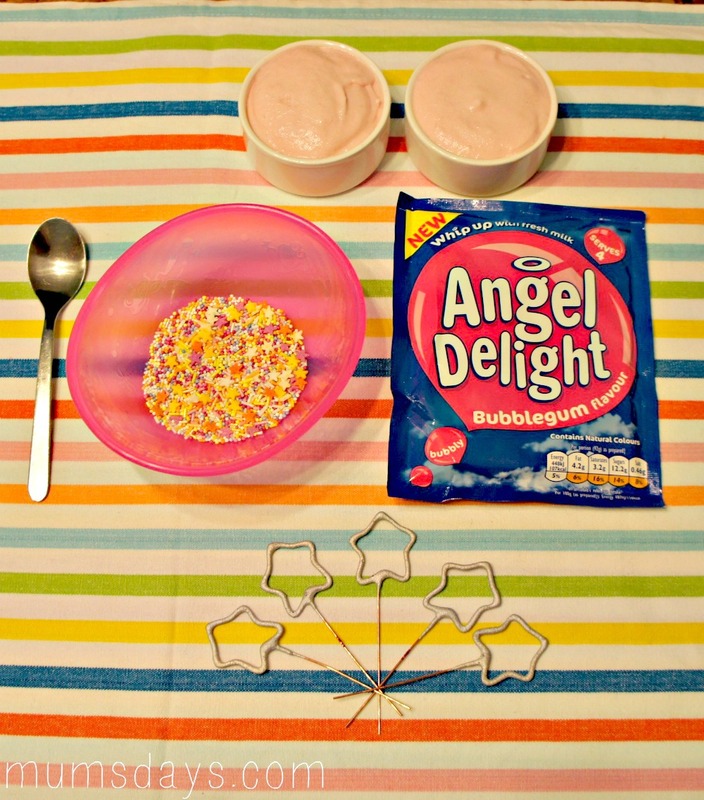 I knew Angel Delight would know how to make it work…not too strong a flavour and satisfyingly creamy! Yes, this dessert isn’t for everyone and certainly not everyday, but as a treat? Yes please! And, then we watched a few fireworks from the comfort of his bedroom window with a cuddle. Perfect date night! 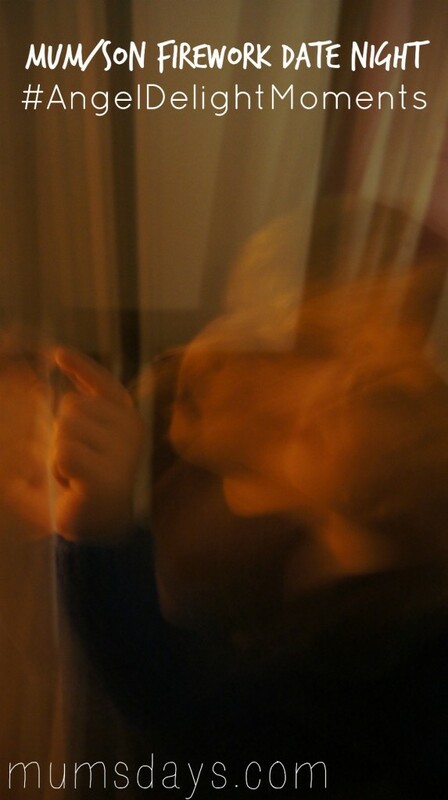 So hard to get a shot of a toddler in the dark – but I like how focused he looks in this picture! 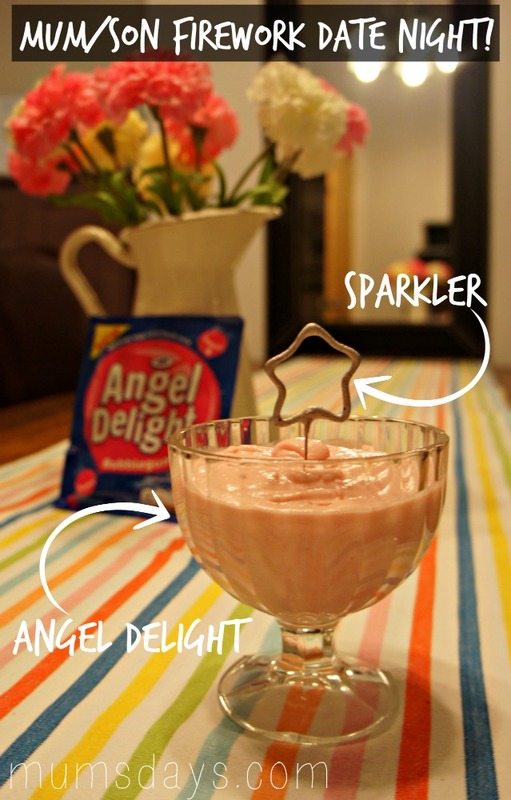 Do you have any Angel Delight moments, memories or awesome recipes to share?! Please do leave me a comment below! 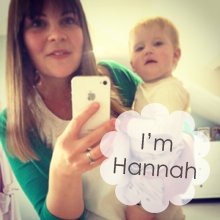 And, do come and join the conversation over on the Mums’ Days Facebook wall. Great videos Hannah, Rueben is so cute! I love the sparklers. Ah Angel Delight! Damn, I loved this stuff when I was a nipper. It was always such a treat to have it. Glad to hear it’s making a bit of a comeback! Ooh I’ve come over all 80s, this was my pudding du jour as a ten year old, I looooved the butterscotch one, Joss hasn’t yet been introduced to the delights yet! Lovely vids and a date night with R sounds sweet!